� Nothing is as it seems.� This feather (see here) is actually from a Blue Jay, and it is actually sitting on a Dogwood leaf.� The leaf is really green with chlorophyll, and components of the feather are really white and dark gray, but the blue color is an illusion. This single secondary wing feather reveals that Blue Jay blue is not really blue. Other famous blue birds such as the Eastern Bluebird (see here) and the Indigo Bunting (see here) are equally untrue in their hue. The proof is in their plume particulars. � Color is a gift from the whole white light of the sun. White light is a combination of Red, Orange, Yellow, Green, Blue, Indigo & Violet as any rainbow will tell you. All color is the result of that light reflecting back into our brains. True colors � pigments � are chemicals that selectively reflect parts of the color spectrum of light. Cardinal Red, for instance, results from a pigment that absorbs all other light waves and only reflects the red spectrum. In other words, there is an actual red �thing� embedded in those red feathers of the cardinal. � The blue color found on birds, butterflies and beetles is the result of something called preferential scattering � not from an actual blue �thing� or pigment. Animal blue is called �structural blue.�� This means that there are micro structures in the tissue that scatter light.� There are tiny air pockets in the keratin (the fingernail like substance that feathers are made of) that scatter the blue light waves. A dark background layer absorbs the red, orange, yellow, green light rays, so all we see are the shades of blue. � To test the structural color idea, I took that �blue� jay feather and moved it around in the sun. As long as it remained in direct light, the blue remained true and intense. When holding up the feather and looking through it toward the sun, the blue disappeared. � I came across this picture of a Purple Emperor butterfly that neatly shows the result of structural blue.� In this view, the right wing looks bright blue because it is scattering light.� The left wing looks brown because it is angled away.� Both wings are the same actual color, brown, but it takes the magic of light to turn on the radiant blue reflection. 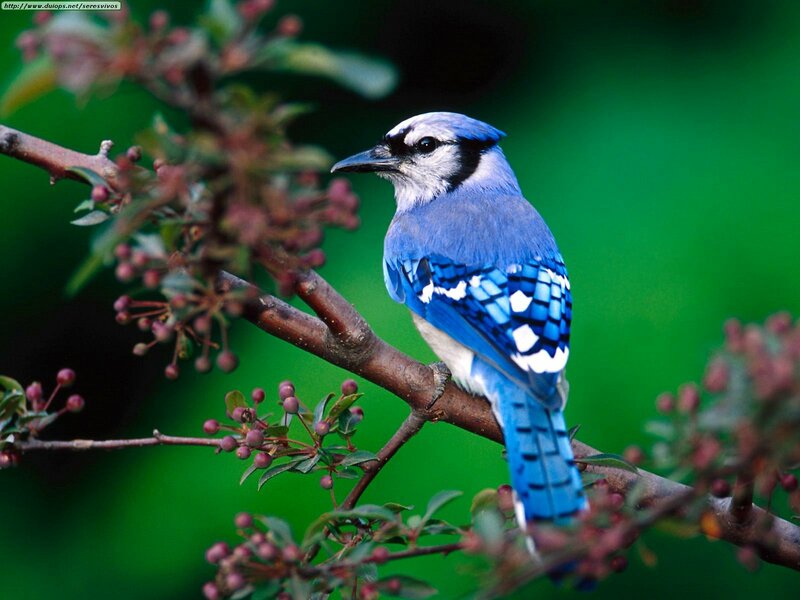 The Blue Jay, Bluebird and Indigo Bunting all suffer the same fate in similar light conditions � they are brown. � I feel at this point we should leave this thing well enough alone. If I go any further, I might start getting into why frogs aren�t really green. Let�s just say that blue is blue even if it it�s not ..well, true blue. Our eyes, cameras and minds record it as so. The blue of the sky, the cobalt dazzle of the bluebird, and the beautiful blue of my wife�s eyes are really blue (and there�s no way I�m going to tell her otherwise). Comments Off on True Blue?